1 WHAT IS THE GENERATIVE DESIGN? 5 How can you introduce generative functional design in your company? Autodesk has always been one of the first to focus its corporate ambitions on new 3D design trends. Both its new design suites or the development of its own 3D printer are clearly focused on innovation in additive manufacturing. So it’s no surprise that Autodesk is venturing headlong into the world of generative design, a concept they’ve been researching alongside Under Armor branded sportswear along with other signatures for some time. WHAT IS THE GENERATIVE DESIGN? Realistic simulation programs not only allow us to validate our designs, but also help us create them. Moreover, algorithms reserved so far to simulation engineers, can even contribute to optimize these designs, improve their functional response and create unimaginable forms in the early stages of development. This is what is known as “generative functional design”. This technique allows to obtain intricate forms, of inconceivable manufacture until the arrival of the additive manufacture or 3D printing. If the engineer is able to select those design criteria that can most influence the final product, such as rigidity, mass, toughness; these algorithms allow to find the geometry suitable for a particular prototype and then can verify these criteria by means of rigorous calculations, classic terrain of realistic simulation. We could say that the “generative functional design” allows the access to the technology of form optimization to the designers without the need to be experts. Reciprocally, calculation engineers can draw inspiration from the results of optimization and propose new ways, previously unimaginable by accessing design tools. The problem arises in a simple way: to minimize the weight, to increase the rigidity, according to a certain restrictions, but the possible solutions can be varied. For this reason, thanks to design features such as those found in the CATIA software, it is possible to generate alternatives that, due to aesthetic or manufacturing factors, will allow us to make the final decision. This tool allows companies to create products with innovative and functional forms hitherto difficult to conceive. In a very basic way, it can be said that it is a method to automatically generate forms from the modification of the variables that define them. Behind this modification are hidden algorithmic definitions (in some cases very complex) that allow intelligent access to a myriad of ways, just to indicate the new needs that the 3D design will have. For demonstration purposes, the idea is that the traditional design starts with a person and a computer and, based on the knowledge of the user and the power of the machine, take advantage of everything together to produce an optimal product. While this approach has worked for thousands of years very well, generative design relies on the processing power of modern computers to create hundreds, or even thousands of variations of a competing design (based on the instructions and drawings provided by The user) to create valid alternatives to the original 3D design. 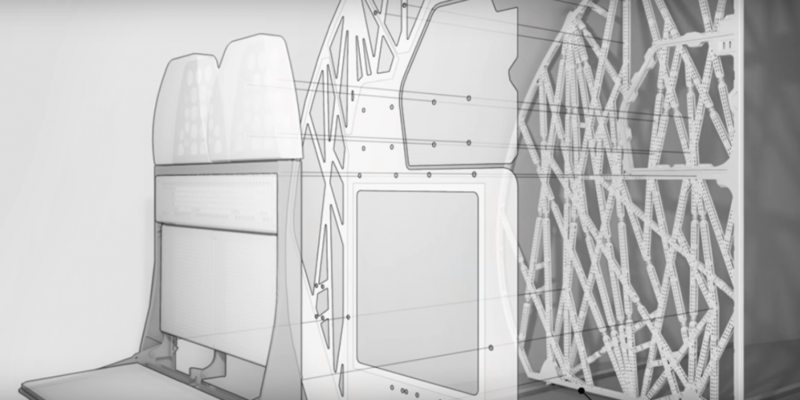 Autodesk clarifies that with the “generative design”, there is no single solution. Instead, there are potentially thousands of great solutions for choosing 3D design that best suits your needs. “This means that the user dictates the physical requirements of any design as well as the material and method used for fabrication and from there the software generates as many results as possible (often using a basic idea such as skeleton, such as Occurs with the reticular approach) while the software is pointing out the strengths and weaknesses present in each iteration to a design that meets all the requirements marked by the designer. Ultimately it is the advent of additive manufacturing and 3D printing which makes this new design approach possible. Lattice-type structures often look more organic than mechanics and it is not practical to do with traditional methods of subtraction production. While the approach is very bold in its formulation, there is no reason to think that this approach cannot be implemented in existing products, and Autodesk is fully aware of it. Autodesk has already created four solutions in the form of 3D design suites that encompass all the possibilities offered by generative design. First is the object synthesis that Autodesk has named Dreamcatcher. It is an approach in which designers feel the premises of 3D design and its materials, and the software executes its artificial intelligence algorithms to produce a wide range of 3D design alternatives so that the creator can choose from a wide variety of possibilities. As a second procedure the lattice modification and the surface optimization are applied with the Within program, which is applied to the lattice structures in the most optimized way possible over existing components to produce lighter parts, Stronger and more efficient. Then there is the topological optimization covered with the Nastran program. This approach reduces the weight of existing parts by automatically removing material that is not necessary for part function while meeting or even exceeding design requirements. As an option for the health and prosthetic sector, the Within Medical suite has also been created, with which modifiers are applied to the creation of trabecular structures (similar to bone structures). In this case, the software generates and distributes small pores (holes) through solid materials to imitate bone structures that are proving to have an astonishing utility in the processes related to the medical implant. As mentioned, Under Armor is taking the lead in using this procedure in the manufacture of more efficient sports shoes. However, other companies such as Airbus and Lightning Motorciyle are receiving assistance from Autodesk to improve efficiency in their products. These processes are proving to save time, increase creativity, save money and, finally, create very efficient geometries. When it comes to 3D printing, there have been many articles written about how 3D printing needs a push in the form of an application that encompasses all processes in one to drive its use towards mass adoption. And while there is no 3D printer today that can do it all, the scope that generative design offers could be the ultimate application adopting additive manufacturing as user friendly technology. Just the idea of ​​being able to apply this 3D design approach to almost any product already manufactured conceived from the beginning of human ingenuity sets gooseflesh. Of course, it is not always necessary to reinvent the wheel, but when all that is needed to do this is to introduce some variables into an evolutionary design system and see what happens to the machine, it makes the idea of ​​reinventing the wheel perhaps worth it. How can you introduce generative functional design in your company? “The creation of digital prototypes, along with calculation and simulation, allows Product Development teams to verify designs within their own environment,” says Dassault Systèmes, the CATIA engineering software developer. “Engineers must have this type of tools in order to better visualize and analyze, at an earlier stage of product development, key factors related to quality and future performance. The CATIA functional design technique allows incorporating all the variants of preliminary design so that they can be used in later stages of development and conclude with the manufacture of the final product. In fact, these software tools not only encourage the innovation and creativity of engineers and architects, but have a great influence on the functionality of the final designs. As technology advances, so does the complexity of our products, and it is technology itself that is helping to change the rules of the game in the realm of design. Nowadays Autodesk offers us software that determines a series of criteria, provides hundreds or thousands of different solutions and we, after that, we would be centered in the choice of that design that satisfies the best way our need. The most shocking thing about all this is that despite all our effort and commitment, maybe without the help of this program, we would never have imagined this option. Saving time, because with the help of a computer we would get thousands of different and optimal designs, in a short time. Without a doubt, this is a radical change in what we know today as a designer, that is, designers would use generative design as a tool with which to set goals and the program would provide the most successful way to achieve the goal final. In the same way, it would contribute in increasing the creativity of the designers since they would pose completely new figures and forms. Likewise, the designer would focus on product innovation and not on structural or material problems. To this day we have several samples of what is being done by large companies.